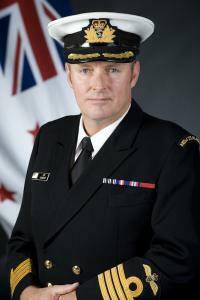 Captain Jim Gilmour will take command of Combined Task Force (CTF 151), for three months from 30 June 2011. He is the first NZ Defence Force naval officer to command a major multinational task force in recent times. “Command of CTF 151 will be a challenge and a unique opportunity. The task force is made up of coalition naval ships and aircraft tasked with disrupting acts of piracy in the sea lanes around the Gulf of Aden and Somali basin,” says Captain Gilmour. NZ Defence Force contributions to counter piracy have been recognised with the request by the US-led Combined Maritime Forces (CMF) Headquarters for New Zealand to fulfil a command role in CTF 151. “NZ Defence Force officers are often required to take part in operations in a challenging and dynamic environment,” says Maritime Component Commander, Commodore John Martin. Captain Gilmour has spent the last two months operating alongside the US Navy during Exercise Pacific Partnership. He was the Commanding Officer of HMNZS Canterbury, the Royal New Zealand Navy’s Amphibious Support Ship. “I was pleased to be able to get an insight into US Navy operating methods and command philosophies which will be useful when I take command of CTF 151,” adds Captain Gilmour. Captain Gilmour and his team will travel to the area this month for a familiarisation period before taking command of the task force.